Hybrid mattresses are a combination of the first two types, with a base of innerspring support coils underneath a few layers of specialty foam. Though innerspring mattresses typically include a layer of foam as well, in a hybrid mattress that amount of foam is increased, the fiber used is decreased, and the top tends to be flatter instead of tufted. The Beautyrest Hybrid Virgil Ultimate Luxury Drop Top and Beautyrest Silver SEA ISLE CITY Twin Lux Firm Tight Top are both examples of a hybrid mattress. This mattress type is easy to move around on and is good at contouring to your body, relieving pressure points while maintaining support where needed, even more than a regular foam mattress. The base is pocketed coil technology which reduces motion transfer, especially helpful if you or your partner are restless sleepers. And the double layers of infused memory foam and gel-infused memory foam mean comfort from both pressure relief and heat diffusing. They also tend to include reinforced edges, meaning the sleep surface of your mattress is larger and sitting on the edge to put on shoes won’t lead to an early tearing down of the edges. There also exists the option of a semi-hybrid, which means a coil base covered with a pillow-top. The end goal is the same: the bounce and give of an innerspring mattress with the added benefits and comfort of foam. A third hybrid, one comprised solely of foam layers, is also an option. Experience energizing sleep with Beautyrest® Hybrid and the best of both worlds with the legendary Beautyrest® Pocketed Coil® support and the cool comfort of AirCool memory foam. Evenloft® Surface A luxurious smooth knit cover without quilting or tufting that lightly stretches to form to your body Lay on the bed and feel the smoothness of the Evenloft® fabric and how it conforms to your body. Helps provide motion separation for undisturbed sleep. Lie down on one side of the mattress. Have your partner lie down on the other side and turn over. Notice how the Pocketed Coil® technology reduces the amount of motion you feel as your partner moves. Lie down on the mattress and feel the support in your lower back. Explain the diamond particles conductive properties. Mention how diamonds’ thermal conductivity tops that of even the best conductors, like copper. Diamonds are even being used to extract heat from electronic devises like semiconductors. This means high end electronic devices can be made smaller and more powerful. Put your hand into the AirCool® Memory Foam and notice how quickly it returns to its original shape. In a lab test, our AirCool® Memory Foam had exceptional air flow. AirCool® Memory Foam Conforms to your body, provides pressure point relief and freedom of movement Put your hand into the AirCool® Memory Foam and notice how quickly it returns to its original shape. Notice how the cover fabric and comfort layers only appear on one side of the mattress. 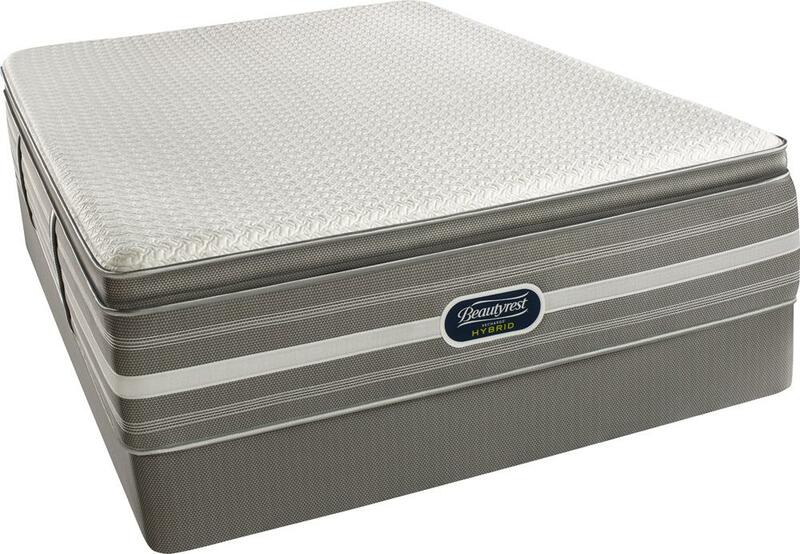 Sit on the edge of the mattress and feel the enhanced support provided by the high-density foam rails. Run your hand along the border and notice how the edge feels solid and stable. Stand on the foundation to feel the rigid structure and absence of movement. 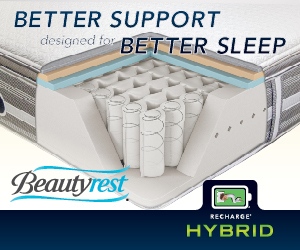 120 Day Confidence Guarantee We are so confident you will love your Beautyrest® Recharge Hybrid mattress that our guarantee lasts for 120 days. 10 Year Limited Warranty Guaranteed long-lasting durability Mattress underwent rigorous industry standard durability tests, including Rollator and Cornell, demonstrated exceptional results and exceeded performance standards. Height 15.5" 15.5" 15.5" 15.5" 15.5" 15.5"